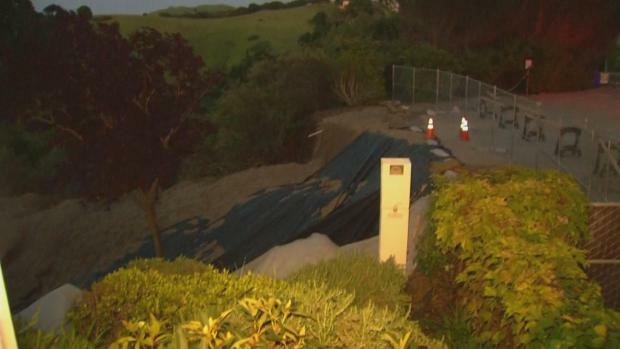 A gradually growing landslide has opened up a massive hole just outside an East Bay retirement home. But residents have not been evacuated from the Bay Park Retirement Community in Pinole. Pete Suratos reports. A gradually growing landslide has opened up a massive hole just outside a retirement center in Pinole, according to a center spokesman. No injuries were reported, and residents of Bay Park Retirement Community at 2621 Appian Way were not evacuated, the center said in a statement. The center spokesman said heavy rains have caused the soil at the back end of the property to erode. Rosalie Le Count, a resident at Bay Park has been documenting the hillside since February, when the big cracks first appeared right behind the home. A gradually growing landslide has opened up a massive hole just outside a retirement center in Pinole, according to a center spokesman. Terry McSweeney reports. "What they're telling us is the soil there is clay, and when clay gets too full of water, it becomes incredibly slippery." Le Count says she's fine but worries about her neighbors. "There are people with hearing and vision disabilities and other disabilities, and they get frightened very easily," she said. Bay Park said in a statement that repairs have been ongoing for some time. "Holiday Retirement has been working with the city of Pinole’s building department and has hired structural and geological engineers to assess the building and grounds on an ongoing basis to ensure the safety of its residents and associates," the center said. The company said it closed the activity and exercise room and part of the dining room out of an abundance of caution. It said if there is any indication that the safety of the community’s residents and associates are in jeopardy, they will be evacuated immediately.